It was a tough opening day in the 2013 U18 European Championship for Women in Vukovara and Vinkovci for the three newly promoted nations as well as the hosts Croatia. They all suffered defeats. There were no shocks in the other matches with the leading U18 nations all coming away with important victories. This season FIBA Europe decided to replace the Relegation Round with the 9th - 16th place classification round. This means that finishing in the first three places during the group phase does not guarantee the teams being assured Division A status. The teams must accumulate enough points over the preliminary and qualification round to qualify for the quarter-finals in order to avoid the 9th - 16th place classification round. In 2012 only the four teams that finished bottom of the preliminary group had been involved in the relegation round. In 2013 the eight teams that fail to qualify for the quarter-finals are involved in the relegation competition. In 2012 the Netherlands missed out on a European Championship bronze medal with a loss to Serbia in their final game. For 35 minutes they battled with Belarus before pulling away with a 14-3 run to win the game (71-59). 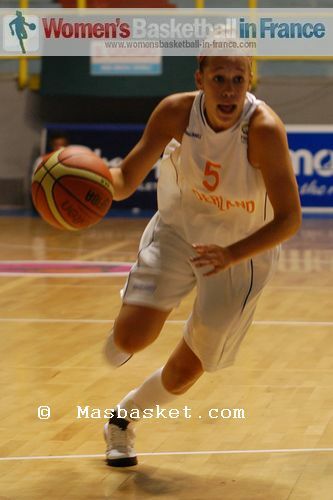 Klaziena Guijt led the Netherlands with 16 points while Isabella Slim had 14 points and 5 steals. Laura Cornelius (in picture) helped herself to 8 assists while scoring 6 points. Viyaleta Kiuliak was the leading player from Belarus with 15 points and 13 rebounds. In the other game in the group it was only in the last five minutes that Turkey were able to put away the Czech Republic 10-2 to win (71-60). Fahriye Bayraktar was the best player from Turkey with 16 points and 5 rebounds while Kamila Hoskova was the leading scorer for the Czech Republic with 18 points. In Group B, Russia blew England away during the first 25 minutes (54-22) and then stepped off the gas allowing their opponents to make the final scoreline more respectable. Russia still won by over 20 points (77-53) with Anna Shchetina scoring 16 points. For England Jay-Ann Bravo-Harriott had 17 points. Spain were ruthless against the hosts Croatia and won comfortably (80-48). Ariadna Pujol (17 points, 6 rebounds) and Leticia Romero (15 points) were the leading scorers for Spain. The two games in Group C were much closer: Serbia beat Greece (65-52) despite 22 points from Anna Stamolamprou. Sanja Mandic and Aleksandra Crvendakic were the main offensive threat for Serbia with 18 and 17 points each. Portugal and Sweden were involved in the lowest scoring game of the day. Sweden won the match (42-34) with 16 points coming from Emma Eriksson. France were never in danger in their Group D tie with Slovenia and started their defense of the title with a (70-49) victory. Marie Milapie, Clarince Djaldi-Tabdi (in picture), Fleur Devillers all scored 10 points. Eva Lisec top scored for Slovenia with 16 points. Italy closed the day one with a 22-point victory against the Slovak Republic (66-44). Cecilia Zandalasin from Italy was the game's top scorer with 21 points.